All kinds of oral disease can destroy oral health. Oral diseases that are important to manage are called “major oral diseases.” In South Korea, dental caries and periodontal disease have become the major managed objects . Moreover, the results of the study that showed that not intraoral diseases but intraoral bacteria are connected to general diseases were recently reported [2,3]. Therefore, there is a need to manage oral diseases that occur with high frequency and that are major contributors to tooth extraction. Dental caries, a major oral disease, is a dental disease that causes dental tissue loss due to the breaking away of the minerals in the teeth and the destruction of the organic substances therein. In addition, it is the most frequently occurring chronic oral disease . Dental caries is caused by many factors, including the salivary and dental factors. The mechanism of the dental factors is the combination of the dental plaque and the extracellular polysaccharide that produces acid, which melts the tooth and causes tooth erosion . As for the salivary factor , a correlation has been shown between the occurrence of dental caries and the element, hydrogen ion concentration, secretion rate, etc. of saliva. It has been reported that the saliva dilutes and neutralizes the acid in the oral cavity, and does protective action against caries by supplying calcium, phosphorus, etc., which are needed for tooth re-mineralization and for developing the acquired pellicle . The saliva contains many kinds of bacteria that originate in various parts of the oral cavity and that can be acquired with comparative ease and quickly; as such, it is currently a useful medium of analysis of periodonto pathogens . Periodontal disease occurs in all the oral cavities of all people. Eighty percent of infants have gingivitis, and most adults suffer from gingivitis and periodontitis . These kinds of periodontal disease are caused by dental plaque. It is hard for external materials to pass through the dental plaque because of the extracellular matrix, which develops a thick layer physically. Thus, if the dental plaque is effectively managed, not only dental caries or periodontal disease can be prevented, but also the recurrence of periodontal disease after treatment. Therefore, removing the dental plaque plays an important role in the management of oral diseases . The representative method of removing dental plaque, the major factor contributing to dental caries and periodontal disease, is tooth brushing and oral gargling. Tooth brushing is the most common method of maintaining dental hygiene personally. Dental plaque can be effectively controlled with proper tooth brushing . Generally, oral gargling is done to feel refreshed after tooth brushing, and to remove halitosis, other than to prevent dental caries and periodontal disease. In addition, oral gargle can be carried and used whenever one wants to . There has been a study that reported that oral gargling removes the supragingival plaque in the anaerophyte in the deep periodontal pocket , and boosts dental plaque control and produces an antibacterial effect related to microbe change . This study compared each study subject’s oral pH acidity, the patient hygiene performance index scores, and the number of bacteria in each study subject’s oral cavity before and after oral gargling and tooth brushing, according to the study subjects’ personal dental hygiene management routine. Thus, this study was conducted with the purpose of motivating people to properly manage their oral health by supplying relevant facts, to prevent the occurrence of the two aforementioned oral diseases. This study was conducted for 3 d, from March 30 to April 1, 2016, on 40 students living in Kagwondo, to compare the number of oral bacteria present in each subject’s oral cavity, and the amount of dental plaque and the pH acidity therein, before and after tooth brushing and oral gargling. The subjects’ average age was the early 20s (20-24 y old). They were divided into four groups, each with 10 subjects (Table 1). Table 1: Changes in the pH acidity, PHP index, and number of bacteria present in the oral cavity by group (CFU). Group A (control group) gargled with 20 ml tap water for 30 s, and group B gargled with 20 ml listerine for 30 s. Group C put toothpaste on their toothbrush and brushed their teeth for 3 min. Group D put toothpaste on their toothbrush and brushed their teeth for 3 min, then gargled with 20 ml listerine for 30 s. Thereafter, 5 ml saliva was taken from each subject and then placed in a sterilized tube. It was then diluted with 35 ml sterilized and distilled water. In sequence, the differences in the number of oral bacteria present, the amount of dental plaque, and the pH acidity in the saliva samples obtained from the different groups were compared. The 30 ml diluted saliva was measured using a pH meter (water quality pH meter, LAQUA, HORIBA Society, Japan). Disclosing solution was spread on the subjects’ premaxilla, and then the subjects were made to gargle with water. In sequence, pictures of the #16 buccal surface, #11 facial surface, #26 buccal surface, #36 lingual surface, #31 facial surface, and #46 lingual surface were taken using an oral camera, and the PHP index was determined. The PHP index calculation method involved dividing a tooth into five parts, with the pigmented part calculated with points, based on the following scale: 0=good; 0.1-1.7=normal; 1.8-3.4=bad; and 3.5-5.0=very bad, according to the criteria. 10 ml saliva was taken from each subject, after which it was diluted with agar, a mixture of brain heart infusion broth (Sigma Aldrich) and agar powder (Samjeon Chemistry), with distilled water 7 times, and was mixed with a superior agar medium. The mixture was then cultivated in a culture medium at 37°C for 72 h (3 d), after which the number of colonies were counted. The before-and-after differences in the pH acidity, PHP index, and CFU of each of the experiment groups were measured using one-way ANOVA, and then the statistical significance was determined using Tukey’s test as a posteriori test. The SPSS statistic program V.19 was used for the statistical analysis, and a 5% significance level was set. The before-and-after pH acidity values of group A, who gargled with water only, did not show a significant difference, but groups B-D showed significantly increased pH acidity results (p<0.05) (Table 1 and Figure 1). Figure 1: Average before-and-after differences of the pH index (p<0.05). No significance before-and-after difference was seen in the PHP index of groups A and B, but groups C and D showed significantly decreased PHP index results (p<0.05) (Table 1 and Figure 2). Figure 2: Average before-and-after differences of the PHP index (p<0.05). No significance before-and-after difference was seen in the number of bacteria present in groups A-C, but group D showed significantly decreased number-of-bacteria results (p<0.05) (Figures 3-6). 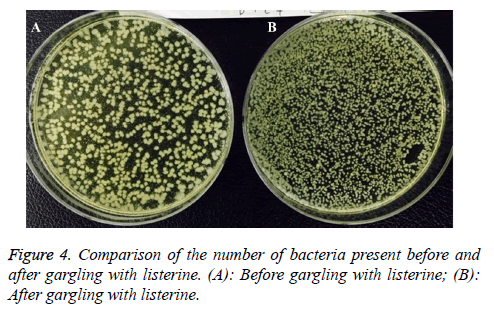 Figure 4: Comparison of the number of bacteria present before and after gargling with listerine. (A): Before gargling with listerine; (B): After gargling with listerine. Figure 5: Comparison of the number of bacteria present before and after tooth brushing. (A): Before tooth brushing; (B): After tooth brushing. 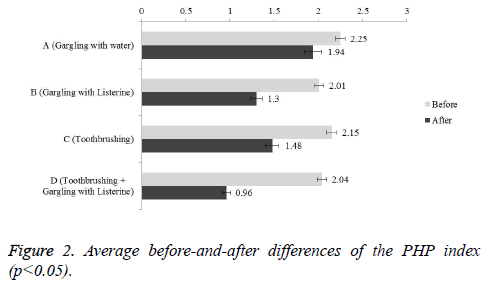 Figure 6: Comparison of the number of bacteria present before and after tooth brushing and then gargling with listerine. (A): Before tooth brushing and gargling with listerine; (B): After tooth brushing and gargling with listerine. As the concept of health promotion spreads across the society, the demand for oral health is rising . Oral disease is a lifestyle disease. Dental caries and periodontal disease, representative oral diseases, can be discovered early and can thus be prevented through early treatment. Most of all, it has been reported that if the primary prevention business is carried out, most people can gain benefits from such, and the level of oral health can improve, allaying the increased concerns of the public . From this point of view, dental plaque, an immediate cause of oral disease, should be controlled to prevent the occurrence of oral diseases . According to a prolonged tracer study, adults can prevent dental plaque and periodontal disease when they have education on both professional dental plaque management and self-management . Tooth brushing, one of the representative mechanical dental plaque control methods, has been used as the most fundamental method of removing dental plaque, but it has negative aspects: it takes a long time, and most people cannot brush their teeth properly because it is hard to master the proper tooth brushing technique. Therefore, several oral gargles have been developed, and oral gargling has been introduced as a subsidiary mechanical method of removing dental plaque that can remove dental plaque more simply than tooth brushing can. Besides, research has been conducted to study the effect of dental plaque control development, using only oral gargling or tooth brushing+oral gargling . Many preceding theses demonstrated that it is effective to use oral gargle in addition to tooth brushing . Furthermore, countries with a better economy or with advanced healthcare development have obtained evidences for this through the assessment of the antibacterial effect against dental plaque [21-23]. 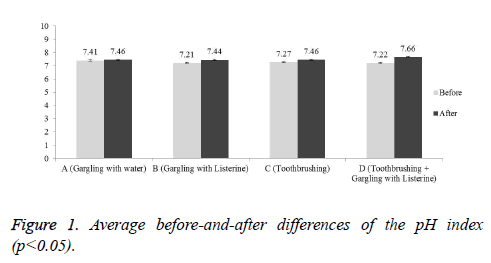 Thus, a comparative analysis of the pH acidity, PHP index, and number of bacteria present in the oral cavity before and after tooth brushing and oral gargling was carried out in this study. Saliva includes immune globulin, electrolytes, mucus, and antibacterial materials besides 99% water, its principal component; as such, it has an antibacterial effect . Additionally, there has been a preceding study that reported that the saliva acts as an agent of oral self-cleaning for maintaining oral hygiene by diluting or removing foreign materials. A decrease in salivation slows down the dental-surface protection [25,26]. Dental plaque is known to occur only when there is interaction among all kinds of causative factors, such as the dental, salivary, microbe, and diet factors, elapsed time, etc. . Moreover, Jeong et al. measured the pH of the saliva and the saliva’s ability to absorb shock and showed that they are interconnected. Therefore, measuring the pH of the saliva should be part of the oral health inspection routine . This study showed significant differences in groups B-D, but not in group A, who gargled with water only, by measuring the before-and-after pH acidity in the saliva (p<0.05). The study results revealed that tooth brushing and oral gargling change the pH into alkalescence and control the acid production in the oral cavity. The representative oral infectious diseases, such as dental caries, periodontal disease, pulp and root apex infection, and oral and maxillofacial tissue infection, originate from infection by the oral resident flora . Periodontal disease is an infectious disease caused by bacteria, and is the most important cause of tooth mortality. To prevent the occurrence of periodontal disease or to control its progress, it seems necessary to remove dental plaque, or bacteria . Also, the most fundamental and effective method of maintaining oral hygiene is by removing dental plaque, which causes dental caries and periodontal disease, the representative oral diseases . There were big before-and-after differences in the results of the measurement of the amount of dental plaque to check the ability to maintain one’s oral hygiene: 1.08 for the PHP index in group D, who did both tooth brushing and oral gargling, followed by group C, who only brushed their teeth and did not gargle. The obtained figures showed a significant difference: 0.67 (p<0.05). The same item was also checked in the study of Cho et al. , and a significant difference in the average before-and-after PHP index was also shown therein: 0.33 when only tooth brushing was done. Based on the results of this study, it can be concluded that tooth brushing+oral gargling can effectively control dental plaque and prevent dental caries. Among the microbes that reside in the oral cavity, Streptococcus mutans, Lacctobacillus casei, etc. are the major causative bacteria. Oral bacteria should be attached to the tooth surface and develop dental plaque to cause dental caries. Especially, Streptococcus mutans attach to the tooth surface and synthesize glucan, a viscid non-aqueous polysaccharide from the sucrose found in food, using the glucosyltransferase that they themselves produce. The synthesized glucan increases the combination of bacteria that proliferate on the tooth surface and causes dental caries [34,35]. The results of this study showed a clear decrease in the number of oral bacteria that cause dental caries when both tooth brushing and oral gargling were done (p<0.05). This means that when both tooth brushing and oral gargling were done, the dental plaque was effectively removed, and there was a dental caries prevention effect. This result is the same as the study result that the dental caries prevention effect was greater when both tooth brushing and oral gargling were done than when only either of them was done. The extent of the dental caries and periodontal disease prevention effects when both tooth brushing and oral gargling are done was compared with that when only either of the two is done, by measuring the changes in the pH acidity, PHP index, and number of bacteria present in the oral cavity after tooth brushing and oral gargling. When both tooth brushing and oral gargling wer e done, the pH acidity increased the most and the oral environment became alkaline, and the number of oral bacteria present in the oral cavity decreased. The PHP index also decreased, and as such, the amount of dental plaque was greatly reduced. It can thus be said that tooth brushing and oral gargling can have a big effect on the prevention of dental caries. Thus, when the study results are taken together, tooth brushing+oral gargling can be said to not only considerably control dental plaque attachment but also reduce the pathogenic bacteria in the oral cavity. These will contribute greatly to the prevention of dental caries. Silk H, Kwok A. Addressing Adolescent Oral Health: A Review. Pediatr Rev 2017; 38: 61-68. Beck J, Garcia R, Heiss G, Vokonas PS, Offenbacher S. Periodontal disease and cardiovascular disease. J Periodontol 1996; 67: 1123-1137. Jung SH, Yang KH, Choi NK, Kim SM, Lim, HJ. Caries prevalence and occlusal variation of children with deciduous dentition in chonnam seashore area. J Korean Acad Pediatr Dent 2008; 35: 92-101. Park SN, Lee DK, Lim YK, Kim HS, Cho E, Jin D, Kim SG, Kook JK. Antimicrobial effect of carvacrol against cariogenic and periodontopathic bacteria. J Korean Microbiol 2012; 52-56. Sabbatani S, Fiorino S. Dental worm disease. Infez Med 2016; 24: 349-358. West NX, Maxwell A, Hughes JA, Parker DM, Newcombe RG, Addy M. A method to measure clinical erosion: the effect of orange juice consumption on erosion of enamel. J Dent 1998; 26: 329-335. Kulekci G, Leblebicioglu B, Keskin F, Ciftci S, Badur S. Salivary detection of periodontopathic bacteria in periodontally healthy children. Anaerobe 2008; 14: 49-54. Marsh PD. Dental plaque as a biofilm and a microbial community-implications for health and disease. BMC Oral Health 2006; 6: 14. Hong SJ, Lee SD, Bae JS. Reduction of plaque and gingival bleeding by toothbrushing education and scaling. J Korean Acad Dent Health 1994; 118: 434-439. Cugini M, Warren PR. The Oral-B CrossAction manual toothbrush: a 5-year literature review. J Can Dent Assoc 2006; 72: 323. Kim CY, Chung SC, Sohn WS. Comparison of the anti-plaque and anti-inflammatory effect of the dentifrices containing NaCl and bamboo salt. J Korean Acad Dent Health 1991; 15: 269-280. Smulow JB, Turesky SS, Hill RG. The effect of supragingival plaque removal on anaerobic bacteria deep periodontal pockets. J Am Dent Assoc 1983; 107: 737-742. Müller HP, Hartmann J, Flores-de-Jacoby L. Clinical alterations in relation to the morphological composition of the subgingival microflora following scaling and root planing. J Clin Periodontol 1986; 13: 825-832. Hur MH, Park J, Maddock-Jennings W, Kim DO, Lee MS. Reduction of mouth malodour and volatile sulphur compounds in intensive care patients using an essential oil mouthwash. Phytother Res 2007; 21: 641-643. Jang K. Factors influencing oral health behaviors in high school students. J Korean Soc Dent Hyg 2013; 13: 287-295. Chae GC, Auh QS, Chun YH, Hong JP. The effect of essential oil on oral bacteria. Oral Med 2003; 26: 11-21. Jansson L, Lavstedt S, Zimmerman M. Marginal bone loss and tooth loss in a sample from the County of Stockholm--a longitudinal study over 20 years. Swed Dent J 2002; 26: 21-29. Nho KS, Kim DK. A study on the relation of stimulated salivary flow rate, ph, lactobacillus and yeast concentrations in saliva. Oral Biol Res 1992; 16: 291-304. Song WS, Son EJ. Kim DM, Chung HJ. A Clinical Trial of dextranase-containing mouthwash on the Inhibition of plaque formation and gingivitis. J Periodontal Implant Sci 2001; 31: 371-388. Barnett ML. The role of therapeutic antimicrobial mouthrinses in clinical practice: control of supragingival plaque and gingivitis. J Am Dent Assoc 2003; 134: 699-704. Gunsolley JC. Clinical efficacy of antimicrobial mouthrinses. J Dent 2010; 38: 6-10. Marsh PD. Controlling the oral biofilm with antimicrobials. J Dent 2010; 38: 11-15. Lawrence HP. Salivary markers of systemic disease: noninvasive diagnosis of disease and monitoring of general health. J Can Dent Assoc 2002; 68: 170-174. Flink H. Studies on the prevalence of reduced salivary flow rate in relation to general health and dental caries, and effect of iron supplementation. Swed Dent J Suppl 2007; 192: 3-50. Greenspan D. Xerostomia: diagnosis and management. Oncology (Williston Park) 1996; 10: 7-11. Yang HJ, Chang HS, Lee SI, Choi BJ. Characteristics of the salivary proteins in the children with rampant dental caries. J Korean Pediatr Dent 1996; 13: 415-418. Jeong SJ, Yoon MS, Im DS, Jeong MS. Dental caries risk can be predicted by simply measuring the pH and buffering capacity of saliva. J Korean Soc Dent Hyg 2006; 6: 159-162. Lim SY, Lee KJ, Kim SJ. The effect of subjective xerostomia and salivary ph in salivary glands stimulated by laughter therapy in frail elderly women. J Korean Acad Community Health Nurs 2016; 27: 72-80. Minah GE, Loesche WJ. Sucrose metabolism by prominent members of the flora isolated from cariogenic and non-cariogenic dental plaques. Infect Immun 1977; 17: 55-61. Chae GC, Auh Q, Chun YH, Hong JP. Antibacterial activity of artemisa capillaris thunb on oral bacteria. J Oral Med Pain 2009; 34: 169-177. Savolainen JJ, Suominen-Taipale AL, Uutela AK, Martelin TP, Niskanen MC, Knuuttila ML. Sense of coherence as a determinant of toothbrushing frequency and level of oral hygiene. J Periodontol 2005; 76: 1006-1012. Cho MS. Variation of plaque Index related to tooth brushing in college students. J Korean Soc Hygienic Sciences 2000; 6: 93-100. Hong SJ, Oh JS, Lee SD, Jeong SS, Chung J. Effect of Lactococcus lactis 1370 and Lactobacillus spp. V20 on plaque reduction. Korean J Dental Health 1998; 22: 81-90. Gibbons RJ, van Houte J. On the formation of dental plaques. J Periodontol 1973; 44: 347-360.